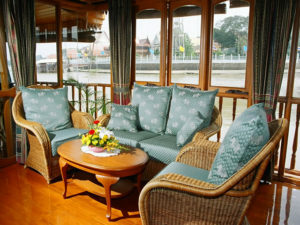 Classic Barges offers high-end private charters for groups of 1 to 20 guests, on day or overnight cruises, on the Chao Phraya River, between Bangkok and Ayutthaya. 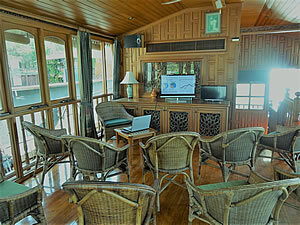 Whether it is a luxury private vacation, sightseeing tour, special occasion, corporate team-building or business entertainment; our luxury teak rice-barge, ‘Montar’, has a variety of furnishing arrangements to suit the event. An itinerary is tailored to suit your individual needs; destinations, times, places of interest, activities and dining preferences are in accordance with your personal requirements. Our programs are designed to be a nostalgic experience reminiscing a bygone era of opulent elegance; exploring: the finest Thai foods, art, history and culture. We trust that you will find our web-site to be informative, not only of our operation, but also of the river, its history, and of the points of interest along the way. 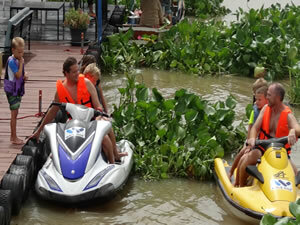 We trust that Thailand and the Chao Phraya River in particular, will provide you with an enjoyable and memorable experience. Please refer to the above menu item appropriate to your requirements and contact us to help you to create your own personalized cruise package.